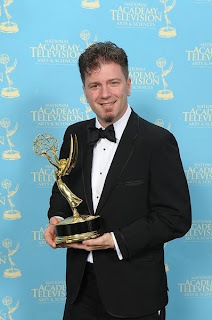 On June 14th, musician, friend, and Loungerati contributor J. Walter Hawkes received an Emmy Award as part of the musical team behind Nickelodeon's Nick, Jr program - the Wonder Pets. The Emmy was for "Outstanding Achievement in Music Direction and Composition." Catch up with the award winning master of trombone and his trio tonight at the Ear Inn - 326 Spring Street between Greenwich & Washington Streets - they go on at midnight! Congrats Walt on quite an achievement!!! ITEM: After a year and half hiatus, The Salon is back to celebrate lounge culture, jazz, burlesque, dance, and good old fashioned cocktails. ITEM: Loungerati honchos Fredo and Jee Jee Giles (reknown for the infamous Piano Store parties from the turn of the 21st Century) team up with the Salon's Fratelli Soluri and Biggish Band leader JC Hopkins to bring back lounging in style. ITEM: The result is a noir-ish affair at the legendary Player's Club on Gramercy Park. The legendary Player's Club, founded in 1888 by Edwin Booth, located on the edge of idyllic Gramercy Park. Hard-swingin' big band playing all original tunes for dancing, special guests vocalists, piano interludes, and burlesque breaks. Dress to play — sequins, feathers, bow ties and skinny ties, spats, backless dresses and finger-curled tresses welcome. Past members of the Player's Club include Cole Porter, Lauren Bacall, Humphrey Bogart, Ernest Hemingway, and Harry Belafonte… Feel up to the part? Lounging and dancing with style since 2001. Late Sunday, I received an email from a friend in the Hamptons. 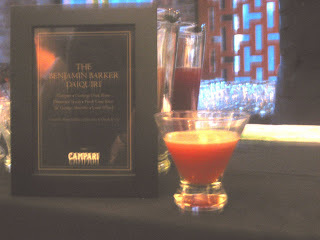 It read, "what ever you do, be at the House of Campari's Industry Night with Radar Magazine featuring New York Mixologists and a burlesque showcase. This Monday, as in tomorrow!" Monday night, hmmm - that is a tough sell for a regular office stiff like me. Then I scanned down at the featured NYC mixologists and knew it was fate. I would be dressed to the nines and ready to imbibe. The folks crafting customized cocktails (oh alliteration!) included a whose who of the New York industry: Allen Katz, Director of Mixology of Southern Wines & Spirits, Brian Miller of Death & Company, Dushan Zaric, Jason Kosmas, and Igor Hadzismajlovic of Employees Only, Naren Young of Bobo, and Lynette Marrero of Elletaria. Oh and it got better. The burlesque numbers would be provided by Amber Ray of Light, Ms. Tickle, and the World Famous "Bob." Gulp! The Employees Only bar: Jason, Igor, and Dushan were on my side of the bar for a change. Their apprentices were furiously at work making refreshing Waterloo Cocktails made from Martin Miller's Gin, Campari, muddled watermelon, and fresh lemon juice. The drinks were served on the rocks in Collins glasses and imbibed with a straw. Now, I am not a big fan of Watermelon, but it was unseasonably hot outside and with the gallery's air conditioner drumming away at London tube levels, I gulped down their cocktail with gusto. Bonus - no pits! Next on the Hit Parade, the Bobo cocktail: This tangerine, vodka, and Campari mixture was aesthetically pleasing. The orange liquid was served up in a martini glass and garnished with a violet flower. It was distributed by comely cocktail waitresses who buzzed around the main floor. I had one and chatted up Allen Katz and several industry folks (some of whom were clearly at checking out the competition.) Katz told us to keep a look out for cocktails with Kirschwasser and other l'eau de vie this summer. I made a note Kirschwasser good, drinks with tangerine mehhhhhh. Upstairs I went and so did the heat. Mind you, I was clad in an impeccably tailored blazer, gabardine slacks, fitted shirt, and a daring tie with the required accoutrement's (deco tie clips, cuff links, in other words - the nines).Unfortunately, the eco-system in the gallery was more conducive to a guayabera or perhaps nothing at all!! Brian Miller was sorting out a delicious cocktail called the Benjamin Barker Daiquiri. This drink is made from Goslings Rum, Campari, St. George Absinthe, Demerara sugar syrup, and fresh lime juice. You could really taste the absinthe flavor but it did not overwhelm the drink and or overpower the slight bitterness of the Campari (which is the point of using it). The cocktail was served up in a stemless martini glass. Next to Mr. Miller, the bar was manned by Lynnette Marrero of Greenwich Village restaurant Elettaria featuring veterans of Freemans and Death & Company. My left eyebrow was arched at 180 degrees as I approached. Her cocktails were served in champagne flutes and though I missed the name (Rose something?) I saw the words tequila - which have haunted me since freshman year of college. So I went safe and asked for a Negroni. Ms. Marrero kindly advised me that only the custom cocktails are available. So I shrugged like Jack Lemmon in Glengarry Glennross, my will power deflated, and reluctantly picked up a flute. The first thing that impacts your senses when you take a sip of this delicious concoction is the dried rose bud that is used as a garnish. It is floral yet effervescent. Then the mixture, Campari, reposo tequila, and sparkling wine begin to numb what's left of your resistance. I fell in love with it. I loved that Rosey drink the second and third time around too. She was my bad habit. She was hypnotic. Then I realized I was broiling. I retreated back downstairs and took a stance near a cool vent like a Gecko lizard. It was strategically perfect. A stone's throw from the EO bar and on route to the bathroom. Everyone walking by naturally started conversation and I met many new friends. Upstairs the burlesque show was going full swing with the Fisherman's Quartet supplying xylophone studded lounge music that Martin Denny would dig. Downstairs the crowd was getting loopy and actually checking out the art for the first time! What a memorable evening and it was only Monday! If anyone was at the event and knows the name of that Rosey drink, please send me an email. I'm getting no hits on Craiglist's Missed Connections! 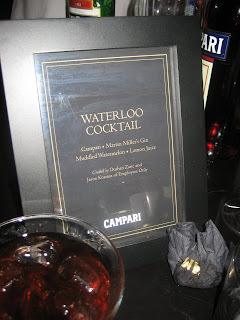 For great pictures of the House of Campari Industry Night check out Patrick McMullen's site.